Well my Olympic dreams aren't going like I planned. away. Fortunately the baby isn't going to join us for a while. So then, I was doing good. I got yarn and everything. Cascade 220. It's gorgeous. What do you think? The picture doesn't do the colors justice. So that was all good. But then the Easter Seals place called us and said they had a cancellation for special needs parents night out and we just can't turn that down, so, we found a tape, recorded the Olympics opening ceremonies, and ran out the door. So, I guess I'm still training, and my event doesn't start until later in the week. I am pretty impressed with myself. (If I could just find a camera that takes pictures in actual color it would be awesome, but that's another post). BTW that's a Josephine's Knot I've charted out there (and some other knots I decided not to use). It's in DH's wedding ring, and he declared today that (*if* it turns out looking good), he needs a scarf. Suuuure. 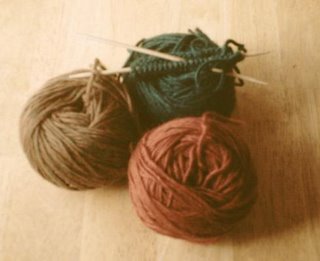 (or who are but are living under a virtual rock), the Knitting Olympics is a challenge, to knit something new and/or difficult for you *personally* to completely, in the 16 days when the Olympic flame is lit. I being one who cannot resist a challenge, obviously am participating. 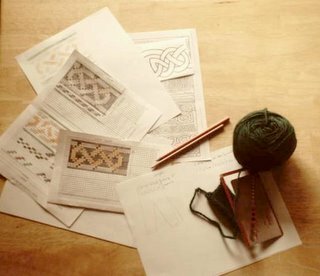 I am making longies for my son, with a fair isle pattern. 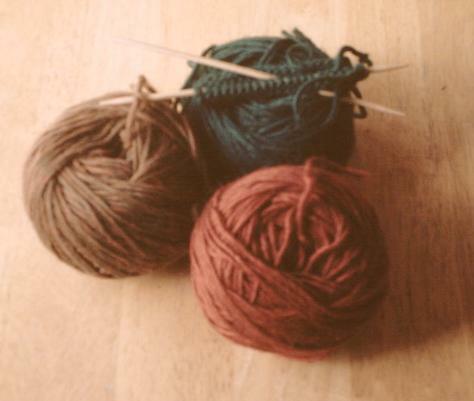 This is another attempt by me to learn how to knit with both hands. I've tried it before, with not much success, and haven't tried in many years. And in case you think I'm off my rocker, there are almost 4000 other people doing this, so at least I'm not the only nut case. Older PostHave you seen any UFOs?